On World Cartoonists' Day, I pay tribute to my muse, and the best cartoonist herself, Nature! Here's a comic based on a true incident, from earlier this year, in Pakke Tiger Reserve, Arunachal Pradesh. 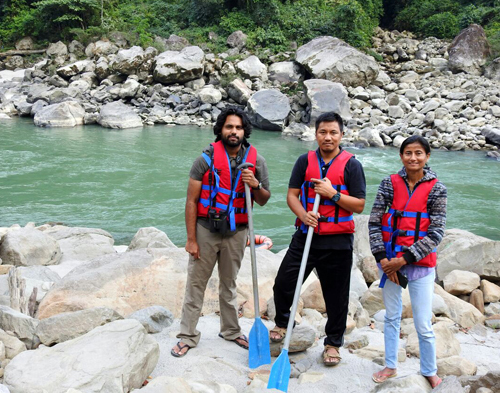 Thanks to my companions on the raft, Kime Rambia, Pratibha Riswadkar and Wangta for saving my life as well as giving me this experience, and to my friend Nandini Velho for making the trip happen. The comic appears on Nature in Focus today. Here's a picture of me with the crew moments before I fell off the raft! (With me are the dynamic Range Officer Kime Rambia, and field biologist Pratibha Riswadkar).